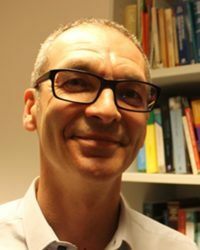 David Harper is Reader in Clinical Psychology at the University of East London where he is also Programme Director (Academic) of the Professional Doctorate in Clinical Psychology. He has a longstanding interest in unusual experiences and beliefs in both clinical and non-clinical populations with a focus on the social context of paranoia and conspiratorial belief. He has co-authored/co-edited three books: Deconstructing Psychopathology (Sage, 1995); Psychology, Mental Health & Distress (Palgrave Macmillan, 2013); and Qualitative Research Methods in Mental Health and Psychotherapy: An Introduction for Students and Practitioners (Wiley, 2012). He was also a co-author of two recent reports by the British Psychological Society: Understanding Psychosis and Schizophrenia (2017) and the Power-Threat-Meaning Framework (2018), an attempt to develop a consistently psychological conceptual framework to understand psychological distress and troubling conduct. He is currently editing Beyond ‘Delusion’: Exploring Unusual Beliefs and Experiences (ISPS/Routledge, forthcoming) – a collection of qualitative studies on a range of topics including conspiratorial beliefs.